Come to our Gallery or we can come to you! Prince Gallery’s ‘Paint, Sip & Chill’ events are about creativity and fun! 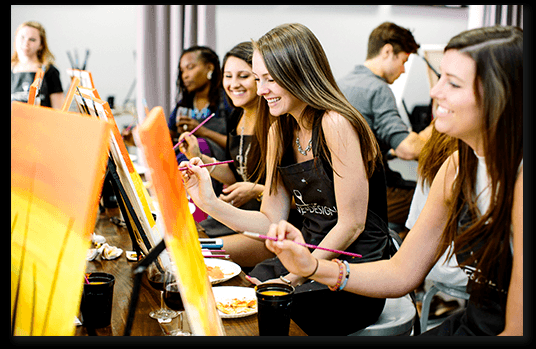 Our Paint, Sip and Chill classes accomodate a minimum of 4 people to 60 people per class. A place where friends and family come to relax, celebrate and feel proud of your art creation and a safe place to discover your inner artist. Open your heart and open your mind to new possibilities and new relationships where your art journey can begin. Our team of professional Artist coaches will lead and guide you each step of the way to complete a beautiful artwork that you never thought you would dream of creating. Your art journey starts from here! Bring your own bottle of drink (must be 18years +) and snack foods and we will provide all your art material needs. We paint with Acrylic paints on a blank canvas size 41x51cm or a size tailored to your event needs. We’ll supply you with brushes, easel, apron and party glasses for your beverages. In a beautiful gallery setting, you will feel at home with the relaxing music. Paint, Sip and Chill events are popular for special celebrations such as social events, date nights, weddings, corporate events, birthday and private party events etc. We also come to you! for Corporate or Private Events. We can bring painting tables and art materials are all supplied. Prices vary depending on location.